Find out how you can find work and plan your working year when you operate as a contractor or freelancer. Welcome to the Accountants etc. 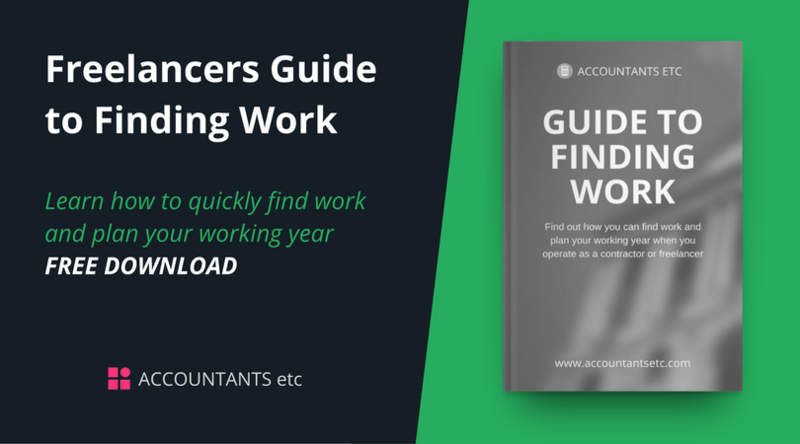 guide designed to help you find work and plan your working year when you operate as a contractor or freelance worker. Whether you want a seamless transition from one contract to another or a short break to recharge your batteries, getting the timing right is crucial when planning your working year. Clearly, there are no guarantees that every contract will arrive exactly when you want it to, but there are ways to keep yourself at the forefront and maximise your options, and this is just as true when you are flat out as when you’re looking for work. If you wait until the work runs out before you start searching for your next role, you could be between jobs for longer than you’re comfortable with. So, even when you’re in work, it is good business sense to keep your eyes and ears open and your name at the forefront of people’s minds. The good news is that it doesn't have to be expensive to do this. Producing a good CV takes time if you do it properly (and why wouldn't you want to do it properly?) but it will cost you nothing. The same applies to taking advantage of online opportunities such as job boards, CV databases, freelance websites and social media. And, for no more than the cost of transport, meeting the right recruitment consultants could pay for itself many times over. You can - and should - also create your own website, attend networking events and try your hand at email marketing. There are many ways to promote your business. We believe that the best thing is to experiment with a few and find out which combination of activities works best for you. Your CV is arguably your most important weapon because it sells your skills and can help to make you stand out from the crowd. When you apply for a new contract, your CV is the document that is most likely to influence whether or not you will get an interview. If you post your CV on job boards and CV databases, it will be your first introduction to many potential clients and recruiters. As a contractor, your relationship with a client will be different to that between an employee and an employer. Because they are not looking to fill permanent roles, employers focus on the immediate needs of specific projects. It’s unlikely they’ll be looking for a future senior manager – or be willing to offer training – when advertising for a fixed term contractor. Ensure that your CV focuses on what you can do and show plenty of examples that you have done it before with outstanding results. Your long-term career goals are fairly irrelevant in this situation, so save the space for hard evidence of your skills and experience. Take time to draft, improve and polish your CV. No matter how much experience you may have and how much success you have had, keep your CV to two sides of A4. This may call for some strict editing, but your CV will stand a better chance of being read if you stick to this limit. Remember that potential employers will probably be checking dozens of CVs, and you don't want to send them to sleep. You want to grab their attention - and keep it. Head your CV with your full name, contact details, any qualifications, industry body memberships and accreditations. Set out your expertise and experience. Make this section specific to each the role you apply for or the attributes the client has prioritised. Sum yourself up in 50 words or less, and personalise this to each role you apply for. Focus on what you can bring to your next role and make sure that they know when you will be available to start. Tell prospective clients about the results you’ve achieved or contributed to. Make them compelling and relevant. Start with your current or most recent role and work backwards. Give dates and the number of renewals for each role. List any specialist technology you can work with. It is important to keep it brief when describing older roles. This will allow more space to enlarge on your most recent activity. However long your current or next assignment lasts, the nature of the beast is such that you are going to have to find a new role at some point, and this is where recruitment agencies can help. They come in all sizes – from specialist consultants to multinational businesses. Some work in specific industry sectors while others focus exclusively on contracting and freelance roles. Do some research. Narrow down the field and target the most appropriate recruitment agencies for the work you’re looking for. You will soon get a good idea who these are from job boards, press ads and word of mouth. Most recruitment agencies are also active on social media, so a quick search on LinkedIn, Twitter or Facebook will also give you a good starting point. It is probably best to avoid those who haven't yet woken up to the importance of social media. Most recruiters like to meet candidates before putting them forward for roles and will probably invite you to an informal meeting. This is your chance to discuss your skills and the sort of contracts you are interested in. It is important that you sell yourself to the recruiter at the meeting. Remember that you will be asking these people to recommend you for positions, so it is imperative that they know what you are capable of and what sort of person you are. They are there to help you. If two or more candidates are evenly matched in terms of skills and experience, factors such as enthusiasm, credibility and personality could be decisive. Presenting a well-crafted CV and an upbeat, convincing account of yourself to a recruitment consultant will increase your chances of landing the contracts you want. When dealing with recruitment consultants, leave the financial negotiations until you have met the client and been offered the contract or a second interview. You’ll be in a stronger position to negotiate when you’ve sold yourself and you know exactly what the role entails. It will also demonstrate that you are not obsessed with salary and will show that you prioritise what you can put into a contract over what you can take out. Don't panic - there are now as many job boards as there are different types of job, and many contractors will be experiencing them for the first time. They are a rich source of opportunity for contractors and freelancers, so you really should check them regularly to see what openings are available in your area. These cover all industry sectors and all geographical areas. Roles are likely to be across all common commercial disciplines such as accounting, HR, sales, and marketing. How Do I Use Job Boards? It is simple. Most of them will ask you to enter a keyword that describes the type of role you’re looking for and the geographical area where you would prefer to work. Their search engine then shows the relevant results. From here, many allow you to further refine your search or access further information before applying for roles that interest you. Because there are so many job boards, it may take you a little time to find those most relevant to you. If you’ve never used a job board before spend some time checking a few out to understand how they work. CV databases are slightly different to job boards. While job boards are used by candidates to find work opportunities, CV databases are used by recruiters to find candidates. If you post your CV to a database that is relevant to your industry, you will instantly make yourself visible to an unlimited number of people looking for the skills and experience you can offer. And they will come to you. This is yet another reason to hone your CV for maximum impact. In terms of the format of your online CV, the checklist above still applies. However, some CV databases will let you upload images, audio files and video as well. Think of the advantage you will have it you post footage of yourself answering awkward questions or showing how you would approach a particular type of work-related problem. Quite apart from anything else, it will ensure that you stand out from the rest and it will help you to make the right impression before you have even met your potential employer. Registering at CV libraries is quick, easy and usually free. If they offer CV writing tips and interview techniques, be sure to take them on board, but be wary of any service that asks to see your CV and then offers to rewrite it - for a fee! If you follow our guidelines you will not have to pay anybody to produce your CV and will have a document that will make you stand out from the crowd. Another useful resource for freelancers is the increasing number of freelance websites. Effectively, these are meeting places for businesses looking for freelance help, usually for a one-off project, and a suitable freelancer. The website acts as a go-between. Typically, a client company will advertise its project on the site. It may, for instance, be looking for a graphic designer to produce artwork for a brochure. The advert will set out the scope of the project, the deadlines, the level of expertise it wants the candidate to have and the price it is willing to pay. To apply for the role, freelance graphic designers must be signed up with the site and have a profile. Ideally, they will have their portfolio uploaded so the client can see examples of their work. From the applications it receives, the client decides which freelancer, if any, it wants to place the work with and the project gets started. When the freelancer’s work is approved, the client pays the freelance website. The freelance website then pays the freelance graphic designer. There are many freelance websites, and each have their own strengths across different market sectors and geographical regions. Globally, the big names you might want to check out are Elance, PeoplePerHour, Guru, Freelancer and Upwork. These days, cheap web hosting and free site-building tools such as WordPress mean that getting a professional website up and running is quicker and easier than it has ever been. You don't need us to tell you that your website is your opportunity to promote your skills, experience and services in your own words and structure. For many potential clients, it could be their first introduction to you and your business. For others, it could reinforce the impression you create at networking events and other meetings. Use your website to encourage people to contact you directly and connect with you on social media. And make sure that it stands out from the others in your field, otherwise, why would they choose you? It’s far-reaching, it gets results and it is free. It should surprise nobody that social media is, to varying extents, used by almost every business that is serious about networking. As a business networking tool, LinkedIn is indispensable. Globally, it is used by a staggering 300 million people. It is the perfect place to promote your skills, your experience, your insights and your achievements to a global audience. You can join industry groups, endorse your business associates, get endorsed for your own skills, follow industry news and search for people, companies and recruiters in your sector. You’ll also be able to track your contacts’ career progression, as LinkedIn lets you know when they get promoted, move job and achieve other milestones. You can create a personal profile and/or company pages to promote your business and post blogs and other content that will be visible to your contacts. There’s a free membership option as well as premium package, so LinkedIn doesn’t have to cost you money. A word of advice though - there are times when people within your LinkedIn groups will post articles that you don't agree with. It is always best to keep your opinions to yourself. By all means speak to them privately but do not take to a public group to tell somebody that they don't know what they are talking about. Conferences, exhibitions and events such as local chamber of commerce and chamber of trade breakfasts and lunches are opportunities to network. You may not feel at home trying to work a room, but many people also feel the same way, so don't worry. People like being addressed personally – within reason. It builds rapport and helps you remember their names too. It can be overdone, though, so use your judgment. When you constantly use the other person’s name in a conversation, it sounds false. And don't ever assume that you can call somebody you have met by their first name - wait for them to say: "Please, call me John." People like to talk about their work and love when they have an audience that is interested. Listen to what they are saying and ask questions - it will show that you care and will assist you when it comes to developing a good rapport with a new contact. There’s also a good chance that you will discover some common ground that could lead to new business for you. Where possible, exchange business cards when meeting new people in a business setting. As well as showing interest in them, it will make it easier for you to make- follow up contact after the event. Keep the rapport alive and the contact going. If you’ve had a conversation that needs following up, do it as soon as you can. And don’t forget to connect with your new contacts on LinkedIn and follow them on Twitter. Networking, both online and offline, gets easier the more you do it. If you keep at it, you will get results. Email marketing is a highly cost-effective way to open doors. The downside is that you will have to spend a lot of time building – and maintaining – an email database and create relevant email communications on a timely basis. You will also need to know how to avoid getting blocked by spam filters.